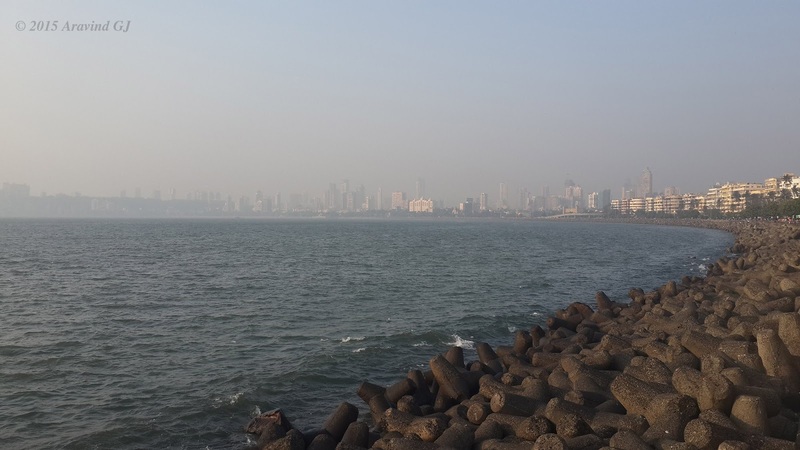 On the way to Bera, I had some time in Mumbai before taking the train. Last time I visited Mumbai was 29 years back (Ignoring transit at airport), so I decided to spend this time visiting some places. 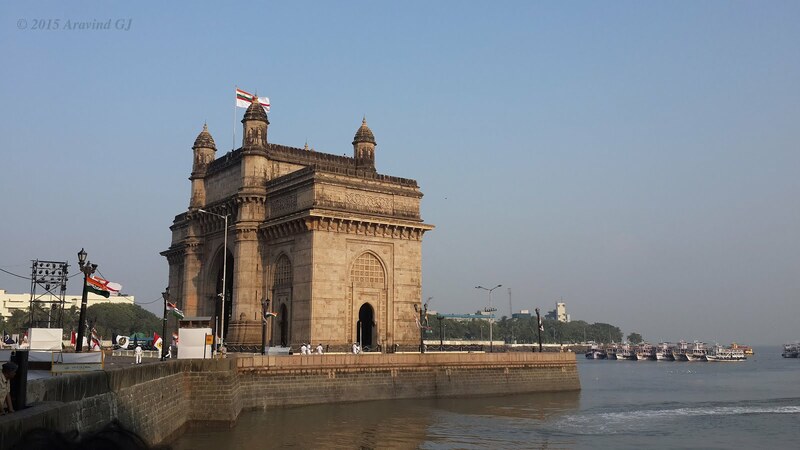 I went to Gateway of India and enjoyed sunset at Marine drive. It was then time to go to Bandra terminus to catch the train to Bera. The easiest option was to take a taxi but I gave a thought of commuting in Mumbai local train. With some browsing I found that local train runs between Church gate and Bandra. I was not sure whether it was a good idea to use local train as I had luggage to carry with. Mumbai local trains are famous for its crowds. But anyway I decided to give it a try. I was taken a bit aback by the crowd at the station. Being evening peak hour, it was not surprising!! I looked for the place to buy tickets which I found easily. While there was a short queue at the counter, automatic ticket vending machine caught my attention. It was very simple. I need to chose the zone and the machine showed the price to pay. In my case it was ten rupees for the 15 km journey. Very cheap!! The minimum charge in BMTC must be higher than that!! It is required to have exact change and in my case it was not difficult. And I got the ticket. It was a 2nd class ticket and I was not sure whether you can get 1st class ticket from vending machine. I moved towards platform. I was overwhelmed at the platform. Only train number was displayed which did not make any sense to me. Good thing about Mumbai is that there are people who help. I asked a policemen who promptly indicated that there are two types of train, fast and slow. He showed me the platform to stand for those trains. I chose to go on fast train. The train had not yet arrived but there was quite a crowd. At one place, there were only ladies standing. It must be the place of ladies coach, I thought. I walked further and started waiting for the train. When train arrived people just jumped into the train. I could not be so agile with my luggage. I was still on the platform thinking my next step. I do not like crowds. A thought of going via taxi came to my head but I decided to ignore it and boarded the train. All seats were fully occupied. I stood near the door after ensuring that Bandra platform lies on that side. It was also convenient as I could place my luggage on the carrier next to it. I understood why the local train is so popular. It is the cheapest and the fastest mode to travel in Mumbai. For example, distance between Church Gate and Bandra was covered in 20-25 minutes. It would take more than an hour in peak traffic. I had a look at the kind of people who were travelling. There were middle class people and also from low income group. Also, I saw people busy with latest gadgets. So, it looks like it is the common mode of transport of most people in Mumbai (Except for elite). One has to be careful as the trains are also place for pickpocketers. The crowd which looked fine at the starting point of Church Gate became unbearable at Dadar. I could not move an inch. Few minutes before Bandra, fellow passengers reminded me to take luggage. “It will not be possible if you try just before getting down”, they told. It was so nice of them. Bandra is another busy station and I was asked to jump even before train cane to a complete halt. Else, I have to be ready to be pushed back inside by people entering in. As i prepared to get down, there was already group of people barging in. I just managed to get down unscathed with my luggage!! My destination was Bandra terminus which was about a km away. On coming out of station, I was shocked. I expected it to be posh but it was dark and shady. I dropped the plan to walk the remaining distance. It seemed BEST buses do not have a feeder service from railway stations. Autos had filled the void and were taking people on sharing basis. I got a seat next to the driver in a crowded auto who promptly dropped me at Bandra terminus. That ended my first experience with Mumbai local train. I have been on Mumbai trains ,cant agree more with your points.You should have tried the first class ,relatively they are better.Glad to see for an outside you made it in onepiece at peak time. But in general people are helpful in Mumbai. Thanks Arjun. I was not aware about first class when I booked ticket in vending machine! !